Searching for the secret of gunpowder, twenty European mercenaries have traveled to China during the reign of the Renzong Emperor (AD 1010–63). A few miles north of the Great Wall, they are pursued by Khitan bandits, who have already killed some of the men. Upon escaping, they seek refuge in a cave but are attacked by an unknown monster, leaving only William and Tovar alive, with the former having slashed off the monster's hand. The two decide to bring the arm with them. 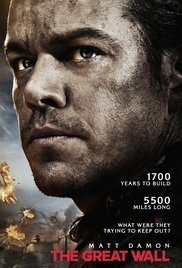 The next day, they stumble upon the Great Wall and are taken prisoner by Chinese soldiers of a secretive military sect called the Nameless Order, led by General Shao and Strategist Wang. Read more on Wikipedia.